World Record -- 42 lbs. 2 oz. It is impossible to even think about this fish without realizing that they are very close to the Rainbow Trout. So close that they are, in fact, the SAME FISH!!! 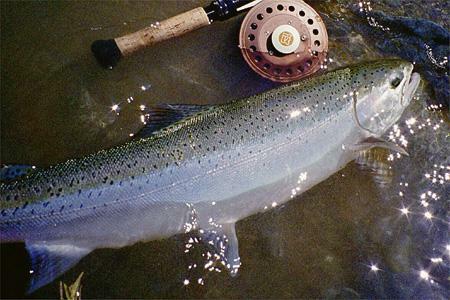 Steelhead live their normal life out in the ocean whereas the Rainbow stays in fresh water streams, lakes, and rivers. They migrate to fresh waters each year to spawn, though. So catching one in your favorite little fishing stream is possible at the right time of the year. This fish begins life as a simple Rainbow Trout, meandering along doing what trout do and looking for food. After they have matured at about 2 or 3 years, some of them migrate to the sea. Oddly enough, nobody really knows why this is so. It is believed that the decision to head to sea is related to a food supply. If an ample food supply is available, they stay where they are and remain a Rainbow, or Redband, Trout. 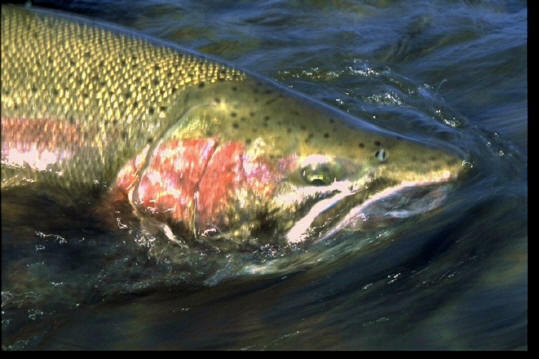 If food is scarce, then the trout may head seaward to find greener “waters”.The man of, er, fish of steel (sorry about that, Superman) will lose the Rainbow stripe on the side and develop a pointy snout. So if it looks like it's snubbing you, it is. The body will usually be more silver in color and, get ready fellas, they grow BIGGER than their colorful cousins. They can get as large as 50 pounds plus (but like, Bigfoot, no one has really found one that size and hauled it to a scale for an official weigh-in). Obviously, this is not always the case, so a much smaller size is the norm at around half that on average. Still a 25 pound Steelhead is a better catch than a 5 pound Rainbow any day, right? (nod your head and say ‘yes’). The world record was caught in Alaska in 1992 and weighed over 42 pounds 2 ounces, and was 41” long! Caught by a kid of about 15! The only other catch to come close is a 28 pounder caught in Oregon in 2005 and the angler, in true sportsman fashion, let it go. Grab your rods and let’s head to Oregon, folks! They eat exactly as other trout do. They are opportunity feeders and will take insects floating by on the current, scuds, and small crustaceans when available. Even smaller fish, including other trout, may become prey. Just about any preparation used with Rainbows will work with Mr. Steel. Broiling, baking, smoking, grilling, or deep frying are all GOOD ways to cook them. My personal favorite?Just giving it to the wife whole and say “surprise me!” Last time, she hit me upside the head with it! Colors range from an olive green with spots to a bright silvery sheen as a result of the salt water. 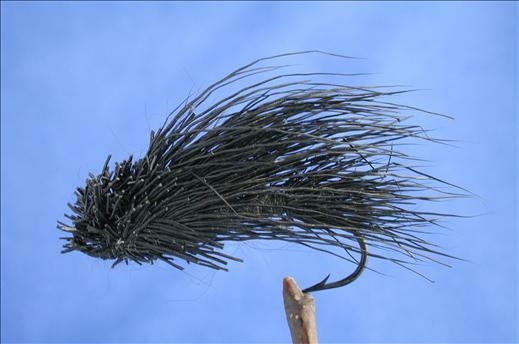 A severely pointed head is the dead giveaway, though, and that’s what led to the name “steelhead” along with the silver grey color. As I said, these are the same as Rainbow Trout. Weren’t you listening? Just kidding. As much as that is true, Steelhead can be mistaken for brook trout or brown trout when the color is more of a dark olive green. The spots on the body cause further mistakes to be made, even by seasoned anglers of all ages. The main difference is where they live. Now, go find one and tighten up your line! !